The Optishokz are a cool idea, but are a little chunky and don’t quite have the same awesome impact that the Aftershokz Trekz Air offer. 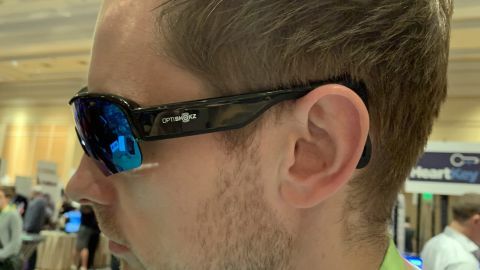 The Optishokz Revvez aren’t new in terms of what's being offered - sunglasses that pack integrated headphones that let you also listen to music - but doing it through bone conduction is. The new sunglasses look, largely, like a standard pair of running ray-blockers, but offer the audio through the rear of the arms, where small vibrating pads live. They’re up there with the more innovative items we’ve seen at CES 2019, but are they a little too hefty on the head for what they offer? The Revvez price is only $99 if you pick them up currently through IndieGogo, or you can pay $179 ($199 for the polarized lenses) when the early-bird discount ends. These sunglasses will go on sale in June of this year, according to parent company Aftershokz. While we’re really into the theory of what these sunglasses/headphone hybrids offer, we’re less sold of the design of them. While it would be madness to expect no heft at all, with a battery, vibrating pads and Bluetooth connectivity built in, you are well aware that you’re wearing something larger than a standard lightweight pair of sunglasses. This may put off some runners who enjoy the lightest of eyewear, but they’re far from uncomfortable to wear. There are three buttons on the bottom of the right-hand arm, but they’re a little harder to press on the go - there’s a high level of flex in the keys, which is odd when on sister product Aftershokz Trekz Air, things are very easy to press on the go. It’s not terrible, but when sprinting changing tracks or the volume won’t be that simple. There’s a simple microUSB charging port to juice these headphones up, and they should last up to six hours on a single charge. (That’s six hours of music playback. The sun-blocking mechanism will last forever, we assume). Listening to the Optishokz Revvez on the loud demo area, it was hard to actually hear anything and see how well they worked. The pads on the ends of the arms hinge down pleasantly, before connecting behind your ears. This is different to other bone conducting headphones, where the pads usually sit in front of the ears, and the music didn’t feel as loud with the sound in the new position. It’s worth reiterating that we weren’t in the best environment for the sound quality, but it definitely felt a little quieter. That said, the placement of the pads means one awesome thing: you can wear these in any race and nobody is going to stop and disqualify you for using headphones, which many events do these days. There’s something wonderful about the sneakiness of this ploy that appeals to us, especially as music can be a real key benefit to newer runners. You’ll need to stream the music over a phone or enabled smartwatch, but there’s something hugely futuristic about this set up. As mentioned, using the buttons to turn the sound up and down or activating playback wasn’t as easy as on some other Aftershokz products, but we still found it possible to do - although we weren’t jogging in the demo area. Weird, right? The ‘hidden’ aspect of these sunglasses / headphones combo is the coolest thing by far, with the fact you could wear these anywhere and nobody would be aware of your tunes (unless they get near and hear the sound leaking out). The size of the glasses is a little large, and the design isn’t superbly cutting-edge in terms of fashion, but overall this is an interesting concept and it’ll be interesting to follow its progress on IndieGogo.